The traditional method of education is very abstract in nature, even for the very young child. Each subject is taught as a stand-alone, without regard to how the different subjects might relate. In addition, some subjects may not be taught in their logical sequence, or areas of a subject may be skipped over entirely. Later, it is hoped, the child will be able to put the pieces together as a whole. The goal at Montessori Renaissance Academy is to provide an education that recognizes the nature of the child at each stage of development. To accomplish this goal a totally different approach to fulfilling your child’s needs is necessary. Montessori philosophy, along with its extensive and fundamental curriculum, was the logical answer because it was developed based on the nature of the child and how the child develops intellectually and emotionally. In contrast to the traditional method of education, Montessori starts out by showing the child “the whole” (i.e., the formation of the universe). Then with five specially designed Great Stories, a foundation is laid from which to build all the major subject areas upon. There are many Lessor Stories that build on the concepts presented in the Great Stories. The Lessor Storiesconstantly widen the scope of the child’s field of knowledge and understanding while maintaining an interconnection within the curriculum. Each subject area is continually built upon and expanded, working toward ever-higher abstractions. By using this approach the child develops a deeper understanding and greater scope of knowledge because the concepts and information presented have more meaning to the child and are more readily interconnected within his/her mind. Alexander Graham Bell and Thomas Edison were both supporters of the Montessori Method. Both founders of Google received a Montessori education. 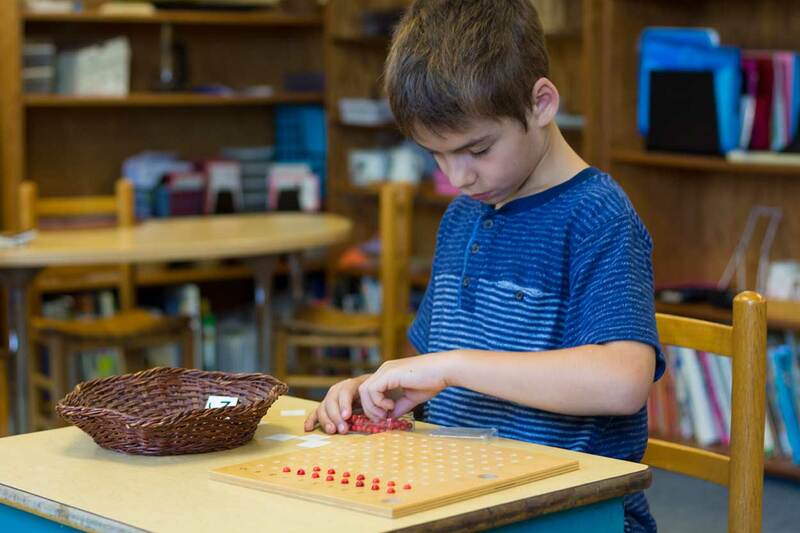 To aid in the child’s proper development, and to help establish a proper foundation for the child, the Montessori classroom has many manipulatives to support the major subject areas. As the child progresses through the curriculum the materials become more abstract until the child is able to work entirely without the support of the manipulatives. An additional feature of the classroom materials is that they are largely self-correcting. By this we mean that the child will be able to determine that an incorrect answer was arrived at on his/her own, allowing him/her to retrace the work and discover the problem and correct it. This helps to reinforce the child’s sense of self-worth while broadening his/her understanding of the subject matter because they, therefore, do not learn to depend on the adult. Each area of the classroom is an integrated part of the curriculum. For example, our foreign language program also reinforces geography and language. We not only cover the basics that are so essential, but also subjects that enhance these basic areas to provide a more well-rounded education. One example is our music program, which is based on Kodaly and Orff. While one of the best music programs around, it also has the added benefit of enhancing the student’s math and language development. Altogether, this helps to give our students a genuine excitement for learning. 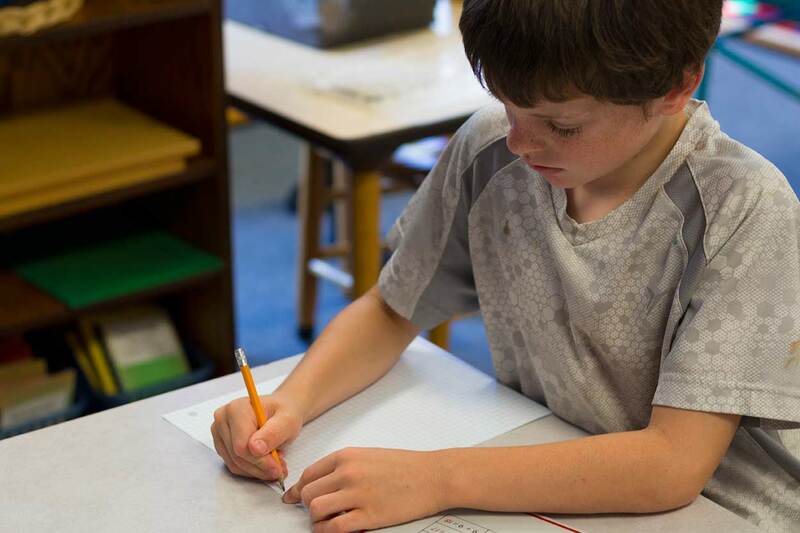 For more information about our elementary program, and how a Montessori education can benefit your child, schedule a private tour today!